He is adorable...that photo just made my morning! What a sweetie-- but goodness, they get big SO fast. what a cutie! Thanks for the link up. Meredith, he is so lovely. What bright eyes! What a great picture!! And how funny is your comment. Meredith, he is SOOOO cute!!! That is such a cute face. I love this picture. I love the photo of this little guy! Is he this happy all the time? I know EXACTLY what you mean about no one liking what you fix. I have five kids, and it seems like, inevitably, someone or several someones are turning up their noses at what I fix. And honestly, I don't think the things I fix are THAT exotic or yucky! Anyway, hope you have a nice day, Meredith! I see Elise's eyes in that picture! What a beautiful baby! oh My! is baby John already so big? John is so adorable! Are those sweet potatoes? Mmmm...I would like a sweet potato. Oh my goodness, he is such a beautiful baby! Meredith... I love your links. Thanks so much for such wonderful blog recommendations! 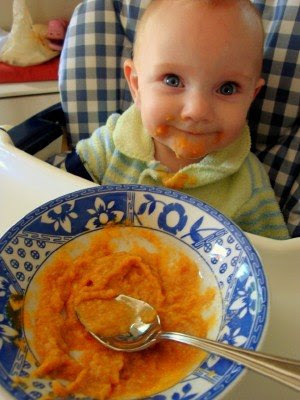 I love that you are using a regular bowl and spoon for baby food. The sweetest thing ever is to have your baby smile at you after a yummy dose of mama's cookin'! Full and Happy - can't go wrong! whatta week in the office! I'd much rather be cookin'!